Royal & Langnickel Paint Brushes. Recently I have been in a rather creative artie kinda mood. I’ll be honest, I ain’t the greatest artist or the most confident painter in the world but pratice makes perfect. But I did think it was a good idea to explain some of the tools of the trade, just like who a makeup artist has their brushes. So do we. 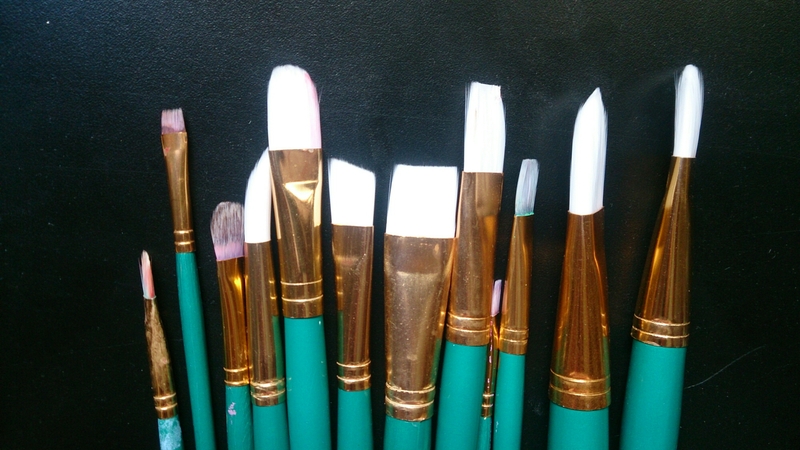 These fantastic brushes are the ‘Royal & Langnickel’ set (just the green handel ones!!) Easy to use and keep clean, although mine are getting a little grubie. Ewwww. 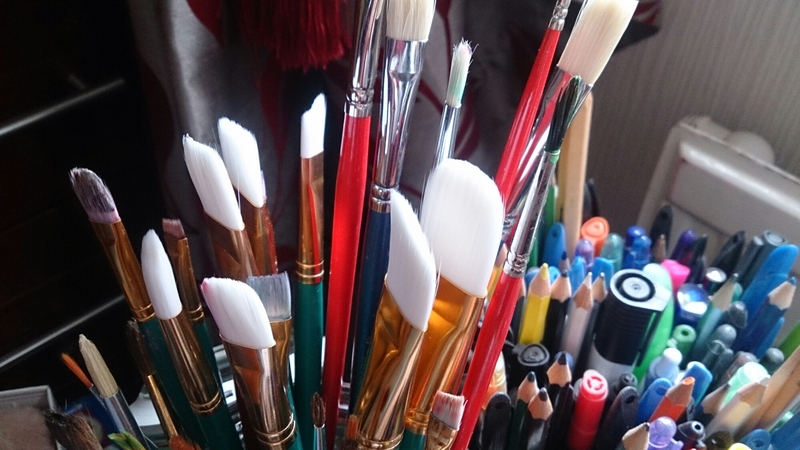 They work brilliantly with all paints, and have so many different uses!! Just like makeup brushes. And are a great beginners kit if anyone wants to get started. Each one gets used differently, I haven’t used them all yet. Will have loads of fun with them when I do!! I had got these from college, but just checked if they can still be purchased. They can!!! At a reasonable price too!! I wouldn’t really recommend for small watercolour pieces or super detailed pieces. But with arcylic anyday and maybe gooashe. They are alot better for the block colour (had another set at college!) Then go in with other brushes or pencils for detailing. A cleaning tip for anyone who doesn’t know, wash your brushes (like these do!!) in warm soapy water and then dab off gently. And never leave brushes in water, brush side down. You will damage the hairs. Hello fellow art lovers and doodling fanatics. We all have our comfort zones when it comes to drawing. Whether it be your favourite charcoal, or that trustie fine point pen that you would feel lost without. We all have that, but we also have things that are compelety out of our comfort zone. And mine……is paint. Give me a pencil and ill be drawing all day, but give me paint and I wont be very comfortable. Simply because it’s not my strength bit I love trying new things. 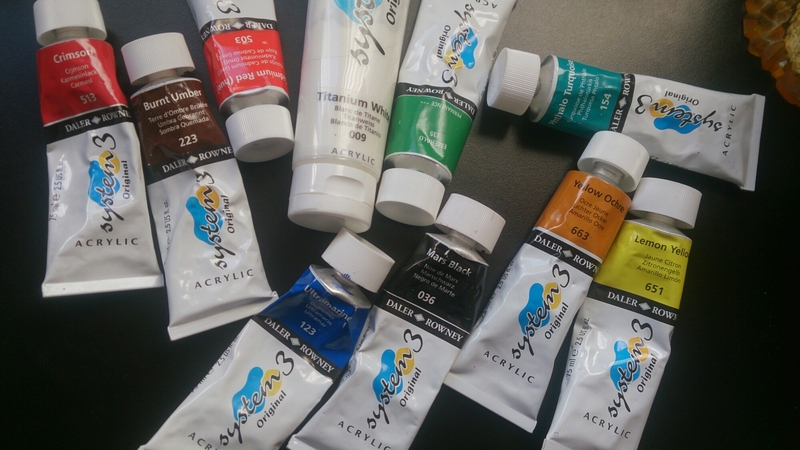 These are gorgeous ‘System 3’ Acrylic paints, which I got when I did go to college. And I have re-purchased these several times. Normally I hate paints with a passion, however I do have to admit that these paints are brilliant. The colour, the blendability, the sheer finish that they give is honestly brilliant. A massive bonus is that I can go on top of them with pencil too add depth where needed. My only problem (and a warning to all of you) don’t get acrylic paint on your clothes, because it will dye. It’s a nightmare to get off too!!! !